It's no secret that I love putting together trend boards, or maybe it is and you just didn't know it ;) If you've been following me a while, here or Instagram, you may remember these or the mommy & me boards I've previously done. I've been thinking a lot lately about different things for the blog, and this was one. I really miss having things I would buy, or have bought for Viv all in one place, but also sharing these fun finds with you guys. So I've decided once a week we will post a trend board! I haven't quite decided what day that will be yet, maybe Tuesday or Thurday, or a weekend day. Which would you guys like? 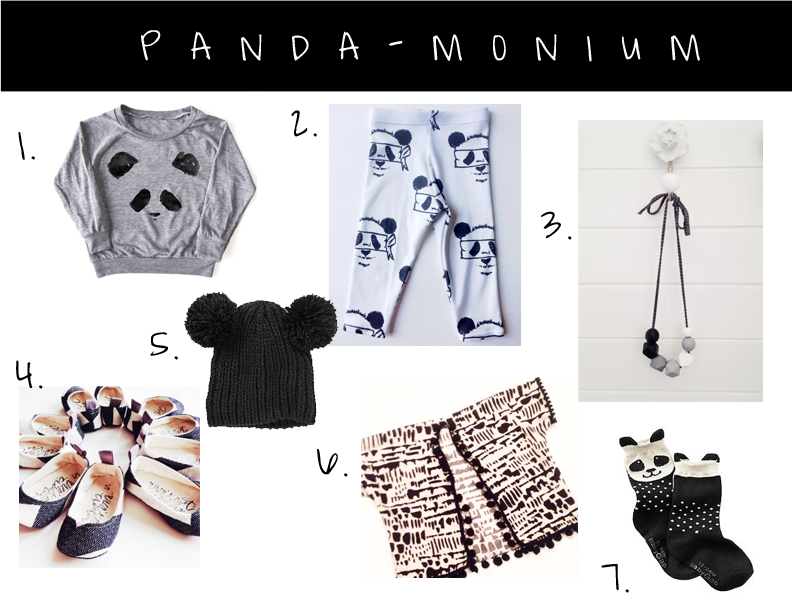 Today's trend board is a Panda-monium! I personally LOVE black and white. I absolutely love everything in today's post. You may even recognize those panda socks from yesterday's Fall Tones post :) Everything is linked below, and I hope you guys enjoy! 1. Kid + Kind Panda Sweatshirt | HERE | If you haven't checked out Kid + Kind, you really should! The sweatshirts are my absolute favorite! Very cute stuff that is gender neutral. 2. Sweet Kiddo Co Bandit Panda Leggings | HERE | If you have a boy & you don't own these, shame on you! I kid, I kid, but how cute are these?? I feel like girls could rock these too! Be sure to sneak a peek at the crocheted and hooded cowls. NEED. 3. Coral and Cloud Beaded Necklace | HERE | I have my eye on a few of these babies. These are hand painted wooden beads on recycled fabric string and the color combos are to die for. 4. Wrens Nest Creations Flats | HERE | What is something negative I can say about them?? Hmm .. NOTHING! I also have these in my "need to get" Viv pile. We also have leggings from Lindsay that are superb! 5. Gap Oversized Beanie | HERE | I have really been enjoying all the pom pom beanies that I've seen. Last year Viv was too small to really rock them, but this year girl, oh yes. She will rock them. 6. Camden & Kate Kimono | HERE | Okay. This is a new shop for us, and who doesn't love a pom pom kimono!? Ughhh. Need this in adult size please. Pom pom everythanggg. 7. Gap Panda Socks | HERE | I mean. Do I need to even explain?